The life of Vernon "Lefty" Gomez is the story of baseball. He was welcomed to the Yankees by Babe Ruth, roomed with Joe DiMaggio, consoled Lou Gehrig the day the "Iron Horse" pulled himself from the line-up, started and won the first All Star game, journeyed to Japan on Major League Baseball's great ambassador tour, won six World Series games without losing one, and had collegiate baseball's top award named after him -- all while becoming a pilot, playing an impressive sax, and hobnobbing with the great entertainers of the day. Though he was a native of California and traveled the globe, Lefty was definitively a Yankee. He played in one of the team's great eras beside the most famous men ever to wear pinstripes. And Lefty was the ideal teammate -- a fierce competitor, a trusted confidant and the funniest guy in the locker room. 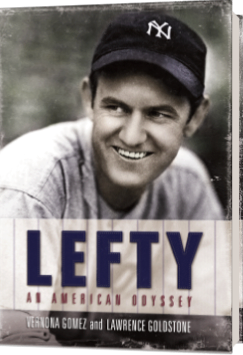 Thanks to the adventures of Lefty and his wife, Broadway star June O'Dea, the stories in this biography feature the likes of Babe Ruth, Jack Dempsey, Lou Gehrig, Ernest Hemingway, Joe DiMaggio, Yogi Berra, Marilyn Monroe, James Michener, Whitey Ford, Bing Russell, Mickey Mantle, Paul Fung, Fidel Castro, Satchel Paige, George M. Cohan, Flo Ziegfeld, President George H.W. Bush, Emperor Hirohito, and many more. When his pro ball career was done, Lefty wasn’t. Logging over 100,000 miles a year, he spread the word about America’s favorite game. Lefty touched thousands of lives across borders and generations. He worked with baseball players from Little League to the Majors, promoted the game in Japan, and managed early professional teams in Cuba and Venezuela. Drawing from never-before-published photos, film clips and interviews with Lefty, June, and over 300 friends, competitors and teammates, the authors vividly recreate the life and adventures of the irreverent southpaw fondly dubbed “El Senor Goofy.” From the dusty streets of turn-of-the-century California, to the frenzied roar of Yankee Stadium and the exuberant sophistication of Broadway, Lefty's unique American life is told by his daughter Vernona Gomez and award-winning writer Lawrence Goldstone.